In 2017, the User Group Wikimedia Ivory Coast kept going ahead, taking action locally, through various projects and programs. Internationally, Wikimedia Community User Group Ivory Coast remained mobilized in the Wikimedia movement, particularly in the francophone area and Africa. The different divisions of Wikimedia Community User Group Ivory Coast have regularly met in statutory meetings of the Executive Board, in meetings of the funding and communication clusters. Three meetings of the Executive Board, extended to the Auditors and to the entire Executive Staff were held respectively on April 28, July 28 and October 24, 2017. They gathered an average of seven members out of the dozen in the workforce. These meetings suggested by the texts of the User Group, are held every two months and aimed to share the news of the movement and to adjudicate on decisions or recommendations involving the User Group. The User Group has two clusters, one dedicated to look for funding for its activities and the other dedicated to its communication. These clusters, set up during the seventh Executive Board meeting, were actually activated in May. Thus, the funding cluster held three meetings and a workshop to learn more about the Rapid Grant mechanism of the Foundation. After the workshop, six applications for funding were submitted to the Foundation with a success rate of 86%. The User Group has even successfully submitted its first Project Grant. We also obtained funding from the Creatives Commons Community Fund to organize a meeting focused on local initiative of a Creatives Commons chapter in Côte d'Ivoire and supported by Wikimedia Côte d'Ivoire. The User Group has finally applied to the call for applications launched by Miss.Africa Seed for financing Wikimedia projects for women. The results are expected in 2018. The Communication cluster has been able to hold three meetings since its creation. They have produced two blog articles on the activities of the User Group, drew out a public relations strategy for 2018 and realized dozen graphic tasks (the User Group visual charter, event flyers, gadget models and certification templates). The User Group has been solicited by third parties for the creation of Wikipedia files. In each case, an audit with recommendations, including a "how to contribute on Wikipedia" training session, was proposed by the User Group. During this semester, Wikimedia Côte d'Ivoire have been focused on three main projects and programs. 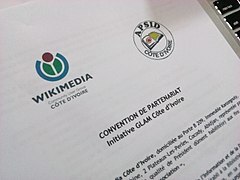 Wikimedia's national collaboration with documentary and heritage information science professionals, the GLAM initiative in Côte d'Ivoire has largely contributed to the international reach of the User Group. Particularly through three appearances in the International newsletter in May, June and August 2017 and communications during Wikimania 2017 in Montreal. At the national level, several partners have been approached for possible collaboration. This led to the signing of an agreement with APSID-CI, the main organization of professionals in the field of documentary information science in Côte d'Ivoire. The User Group continued and completed the pilot phase of the Classes Wikipedia. A summarized infography of the results was disseminated and the User Group asked for a Project Grant to keep the project going in 2018. In addition, since a gap was observed in the quality of Wikipedia articles on Côte d'Ivoire, a Rapid Grant was requested to organize a series of 4 training workshops to strengthen the capacity for qualitative assessment and articles improvement from Ivorian contributors. On September 23, 2017, a meeting was held around this editorial project aimed at strengthening the quality of the article of the centenary leader of Ivorian literature, Bernard Binlin Dadié. Three working groups were set up at the end of this meeting with specific tasks. The User Group's international commitment this semester has been evident in the Wikimedia movement and in the French and African spheres. For its first participation in Wikimania, the User Group of Côte d'Ivoire, represented by its vice-chairman Samuel Guebo, took part in 34 activities out of more than 180, a participation around 18%. These activities take into account those of the Learning days (pre-conference) as well as the sessions of the Wikimania conference itself. Samuel Guebo also facilitated sessions, particularly on the GLAM-WIKI initiative in West Africa and the development of the User Group. The User Group was also involved in the development of the Wikimedia 2030 strategy by helding a dedicated Meet-up with about fifteen local partners. The conclusions published on meta have been reused about fifty times. The User Group has also taken the opportunity to update its national strategy 1720 which runs to 2020. For the second consecutive year, the User Group supported the Wikiconvention Francophone, participating in the work of the Organizing Committee and awarding scholarships. Although five Ivorian delegates initially obtained scholarships, only two of them finally got the visa for France. Member of the International Francophone Association of Librarians and Documentalists (AIFBD) since 2016, Wikimedia Côte d'Ivoire took part in the operations of the renewal of the office of the Association. 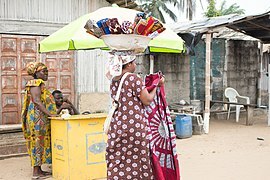 At the regional level, the 4th edition of the Wiki Loves Africa photo contest mobilized Ivorian volunteers. It was essentially about the preparatory actions of the competition which was supposed to start in November 2017. 2017 has been a busy year for Wikimedia Community User Group Côte d’Ivoire. These achievements are the result of the combined efforts of each and every one of the volunteers in a work organization based on the values of Volunteering and Collaboration. ↑ "Wikimedia Community User Group Côte d'Ivoire/Statutes - Meta". meta.wikimedia.org. Retrieved 2018-02-09. ↑ "Wikimedia Community User Group Côte d'Ivoire/Rules - Meta". meta.wikimedia.org. Retrieved 2018-02-09. ↑ "GLAM/Newsletter/May 2017/Contents/Côte d'Ivoire report - Outreach Wiki". outreach.wikimedia.org. Retrieved 2018-02-09. ↑ "GLAM/Newsletter/June 2017/Contents/Côte d'Ivoire report - Outreach Wiki". outreach.wikimedia.org. Retrieved 2018-02-09. ↑ "GLAM/Newsletter/August 2017/Contents/Côte d'Ivoire report - Outreach Wiki". outreach.wikimedia.org. Retrieved 2018-02-09. ↑ "Submissions/Growing a User Group, a roadmap for survival - Wikimania". wikimania2017.wikimedia.org. Retrieved 2018-02-09. ↑ "File:Lightening talks - GLAM in West Africa, contraints and opportunities.pdf - Outreach Wiki" (PDF). outreach.wikimedia.org. Retrieved 2018-02-09. ↑ "Bernard Dadié" (in French). 2018-01-29. ↑ "Wikimedia Community User Group Côte d'Ivoire/Reports/Côte d'Ivoire at Wikimania 2017 - Meta". meta.wikimedia.org. Retrieved 2018-02-09. ↑ "Strategy/Wikimedia movement/2017/Sources/Cycle 2/Wikimedia Community User Côte d'Ivoire Strategy meet-up Abidjan June 10, 2017 - Meta". meta.wikimedia.org. Retrieved 2018-02-09. ↑ "Recommandation No. 2017/01 on the update of the 1720 strategy - Meta". meta.wikimedia.org. Retrieved 2018-02-09. ↑ "WikiConvention francophone/2017/Équipe - Meta". meta.wikimedia.org. Retrieved 2018-02-09. This page was last edited on 15 March 2018, at 12:10.